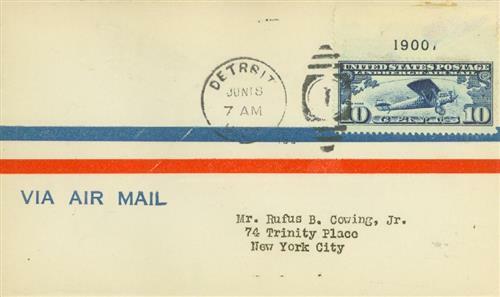 The first two contract airmail routes went into service on February 15, 1926, flying between Detroit and Cleveland and Detroit and Chicago. Charles Lindbergh, who was already an experienced pilot at the age of 24, was then hired by the Robertson Aircraft Company to develop a third route, which was known as Contact Airmail Route #2. This route would fly from Chicago to St. Louis, with stops in Springfield and Peoria. US #C10 was the first US stamp to honor a living person. In the months leading up to the start of the service, Lindbergh surveyed the 278-mile route, establishing the flight and postal operations at each of the four landing fields. He also selected nine additional emergency landing fields, each about 30 miles apart. 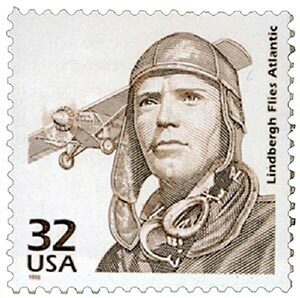 Lindbergh also hired two of his Army flying friends to help him complete the flights. US #C10a – Spirit of St. Louis booklet pane. Days before the inaugural flight, on April 10, 1926, Lindbergh and his team completed survey flights to make sure everything was in order and to help general public interest in the upcoming flight. Then at 5:50 a.m. on April 15, 1926, Lindbergh inaugurated the first flight of the new line, departing Chicago with 87 pounds of mail. All of the covers carried a special commemorative cachet. US #C10 – Uncacheted First Day Cover. From there, Lindbergh flew south to Peoria where he picked up another 23 pounds of mail. He then stopped in Springfield and picked up 93 pounds of mail before completing the last leg of his journey, reaching St. Louis at 9:15 am. 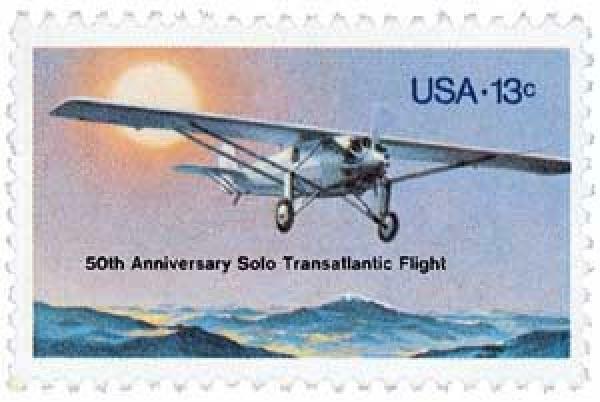 US #1710 was issued for the 50th anniversary of Lindbergh’s transatlantic flight. That afternoon, Phil Love made the return flight back to Chicago. Because the morning flight had generated so much interest, the evening flight carried a large load – 144 pounds from St. Louis alone. Lindbergh and another pilot also departed St. Louis in empty planes, as they expected a large amount of mail in Springfield. And there was! A large crowd had assembled at the field to watch the pilots and they sent out a total of 385 pounds of mail. After picking up 40 pounds of mail in Peoria, the return trip reached Chicago at 7:15 p.m. 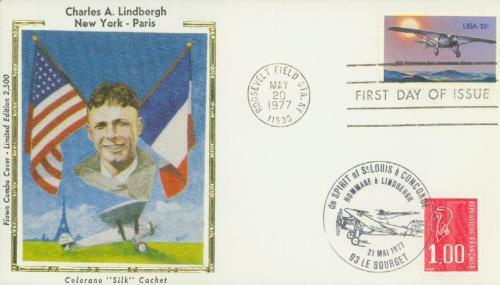 US #1710 – Silk Cachet First Day Cover. 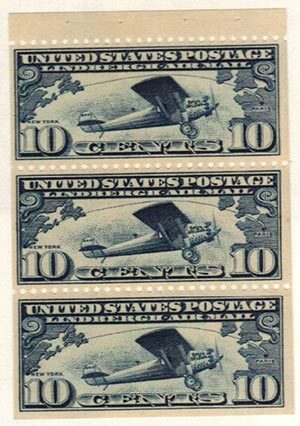 Lindbergh worked as an airmail pilot for 10 months, flying five days a week. On two occasions he was forced to bail out of his plane. On September 16, 1926, his plane ran out of fuel before he could reach Chicago and he had to jump out of the plane over Wedron, Illinois. His 4,000-foot parachute jump was the longest recorded night jump at that time. Two months later, on November 3, he had to jump out of his plane due to bad weather and landed on a barbed wire fence. Item #59715A – 75th anniversary commemorative coin and stamp cover. It was while working as an airmail pilot that Lindbergh first heard about hotel owner Raymond Orteig’s $25,000 prize for the first pilot to fly non-stop across the Atlantic. Just a little over a year after he began his airmail career, Lindbergh became an international celebrity for completing the journey in his plane, the Spirit of St. Louis. 5 Responses to "This Day in History… April 15, 1926"
Thanks Mystic. Nice reading about early pioneers in airmail delivery. Wow, that was a lot of weight for back then. Lots of letters or catalogs? What happened to the planes and mail he jumped out of?